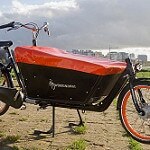 Bakfiets en Meer » Blog Archive » Introducing the WorkCycles Kr8 bakfiets… Finally! 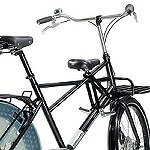 This entry was posted on Tuesday, February 25th, 2014 at 16:09	and is filed under Child and family transport, Technical Stuff, Workbike / Transportfiets. You can follow any responses to this entry through the RSS 2.0 feed.You can skip to the end and leave a response. Pinging is currently not allowed. I’ll venture a guess that riding a Kr8 with kids aboard across the Pyrenees would be slightly more difficult than on a 75hp motorcycle. No mountains here but we do have wind and plenty of very strong racers to make you suffer. 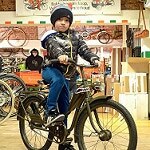 Since you speak of “plenty of very strong racers to make you suffer.”, I read one of your posts about racing in a track, https://www.bakfiets-en-meer.nl/2012/11/14/racing-bikes-at-workcycles-really/. I gotta say I envy you, I always wanted to do that. 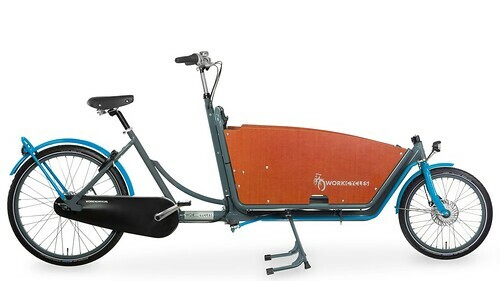 Hi, the Dutch babboe model also recently is sold in the US, I believe no pictures of this one in this blog yet. 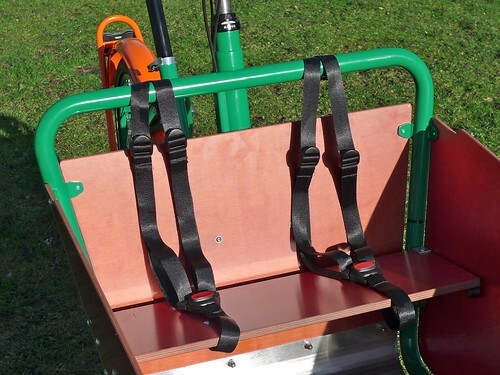 It is quality and affordable, some Dutch parents started that company 10 years ago or so and they have become the biggest in the Netherlands. Great stuff:-). 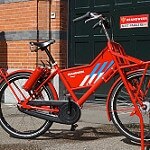 Myamsterdambike.com are selling it in the US to deliver at your home address, rather convenient… Pyrenees…I would not do that hill!!! Pfff, yet more spam from Babboe. Will it ever end? 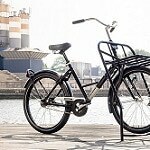 Johan has been posing as a neutral party placing links to myamsterdambike.com wherever possible but doesn’t seem to realize that there’s some animosity between WorkCycles and Babboe since Babboe began posting (fake) comments in my blog. 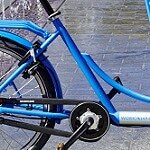 They promote their poor quality bikes and denigrate those of competitors, including WorkCycles amongst others. Regarding the Pyrenees: Can an Alfine 11 take more torque than an Alfine 8? 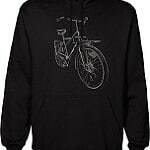 Its not the number of gears, its the lowest ratio that will make or break a mountain tour on a cargo bike. The lowest ratio of Alfine/Nexux 8 is relatively efficient (one gear set in action) and in my experience it is also strong. Alfine 11 is a complex beast, and is unlikely to be advantageous unless geared lower (reliably) than a Alfine/Nexus 8. I just don’t know whether the Alfine 11 is stronger than the Nexus/Alfine 8sp. We’ve tons of experience with the various incarnations of the 8sp and almost none with the 11sp. The 11sp’s lowest gear is the same at 0.527 (52.7% of the input ratio), but the range is wider: 409% vs. 305%. Thus you can use an input ratio with the 11sp that would otherwise be too low with the 8sp. I’d recommend 38/22 or even 33/22, both of which we can fit. Given that both hubs have exactly the same lowest ratio I’ll venture a guess that they also both achieve this by using the same single gear set… probably even using the same internal parts. I’m kind of interested in hubs so I’ve thought about it a lot, and I suspect Alfine 11 is actually a development of Nexus 7. The lowest gear ratio being the same as Nexus/Alfine 8 is pretty suspicious, but note the lack of a direct drive gear (as in Nexus 7). That means they have two planetary gear sets in there with almost the same ratio, but used to raise and lower the ratio in opposition to each other. That is definitely a page from the Nexus 7 playbook. Kind of off topic, but anyway I’d be good and suspicious of just how much torque an Alfine 11 can take compared to Nexus/Alfine 8. I wonder what the restrictions would be regarding laws etc. There has to be some sort of safety issue here, no? That being said, if I could get my hands on one of these, I’d be ecstatic. 1. Minimum age of child on bike in some parts of USA is 12 months… largely ignored. 2. Child saddle behind handlebars apparently not legal in Austria… largely ignored. 3. No more than two kids on a bike in Denmark… completely ignored. 4. Children only to be carried on approved bikes (Japanese only) in Japan… our few customers there ignoring without problems. Now of course I’m not actually recommending that you break local laws, just noting that they’re not always sensible or based or appropriate. Hi! I need a bike to carry my two youngest children. The kr8 looks lovely, but I assume it doesn´t fold or dettach so that you can carry it on the back of your car, right? What choices do you recommend that can be transported in a big suv car? I´m leaning towards buying a zigo leader x2, what´s your opinión on that bike? 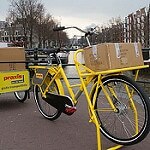 Also, where can I find these kinds of bikes in South America (Chile) or how much would the shipping cost? Please I would really like to hear from you. Tanks! If carrying the bike by car is the prerequisite it’s just not going to be a box bike of any kind. 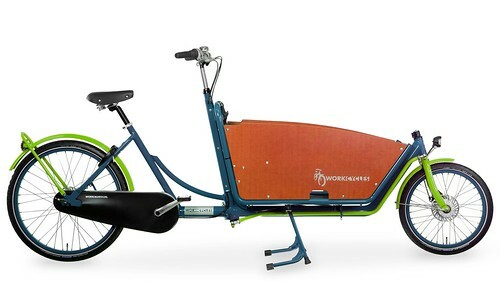 My recommendation would be (of course) a WorkCycles Fr8. 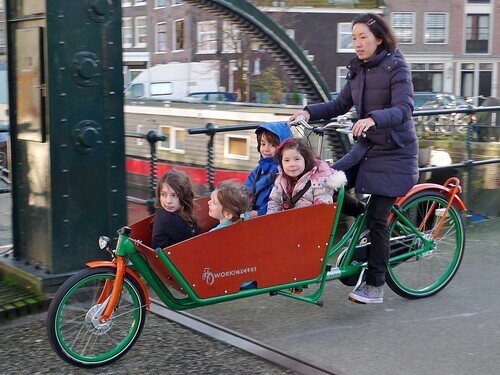 On the Fr8 you’ll comfortably carry two kids of any ages and it will fit on a rear carrier… not every carrier but some are rated for carrying e-bikes and other heavier bicycles. The topic of Fr8 on car carrier has been discussed in the @WorkCycles Facebook group several times. 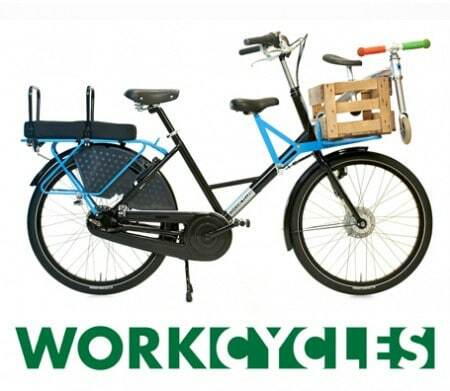 WorkCycles ships all over the world. 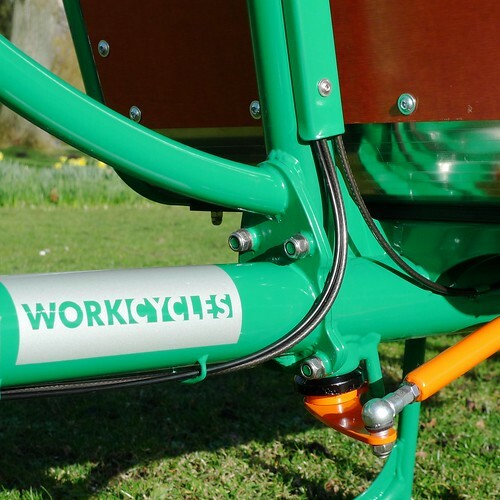 Just contact us via the WorkCycles website for more info about the options and shipping costs. Hi Henry. I need some advising and don’t know where to best ask my questions . Please remove is it’s inappropriate on this thread. I am a single mom to a 5yr old, 16 month old and a 3 month old. Ive recently become disgusted with driving everywhere. Everything we do is in a 5 mile radius. Most things are under 2 miles. 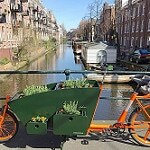 I’ve begun walking everywhere with a jogging stroller but am absolutely craving a cargo bike as our transportation instead. I’m not a biker at all. I wouldn’t know the first thing about bikes. I’ve spent weeks pouring over every article I can find and speaking to bike shops and wholesellers and retailers all over the United states. I should say I do NOT have much disposable income as a single mom of three. It’s for financial reasons that I’m stuck with babboe being my ‘ high end expensive choice’. From what you’ve said, it’s not even quality yet it would take all of my savings to get it. Dare I ask about the WIKE Super Cargo Trike? It’s $1000 less than the babboe. So, if my choices are wike or babboe, would you say it’s better to not have one at all and just walk? Lol… Surely one of those is better than nothing. It’s just sad that’s it’s such a huge purpose and taking all my savings to make a non quality purchase. I live in Florida. It’s flat!!! And I’m never going more than 5 miles away. What are your thoughts? Also: I’m not an experienced biker. I’m not awful, but I only biked as a child and for fun, never for transportation until this recent desire. Where I’ll be biking has lots of crosswalks and signals. Lots of starting and stopping and even getting off bike for the weirdly placed cross walk signals. For these reasons, I think a trike would be best suited for me. Is this assumption wrong? I would REALLY appreciate your expertise . I’m looking to place my order Monday! Oh… And I also expect to only use this for 4 years and then move into something different. 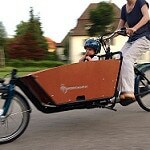 For now, I’m really looking for it to be family time where we talk and interact on our rides so I’d really like them I front of me in a box style bike. 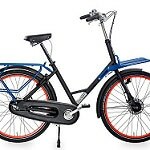 My evaluation of the Babboe bikes and company has already been stated and I’ve seen nothing since to change my opinion. The Wike trike I’ve never seen but their two wheeler is very obviously the same Chinese BSO (bicycle shaped object) that shows up with ever a different name on it, I suppose to avoid liability claims. I could be wrong here but my gut reaction is… RUN AWAY! There was also a guy in Portland, OR building quite cheap cargobikes from discarded old bikes. His bikes from several years ago looked pretty sketchy but I understand they’re getting better. I hope that helps. 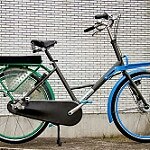 As for trike vs. bike you need to try some bikes. Even in Florida there are some bakfietsen in use. I know we’ve sent several to Gainesville and there are a bunch in the Jacksonville area. 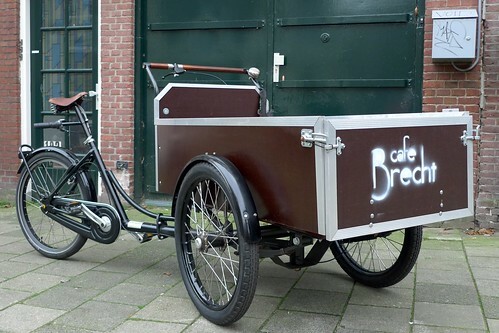 The thing is that for the market, these bi- and tricycles will be probably be conceived so differently that they probably should have entirely different names, even though they from a builder´s perspective are similar. 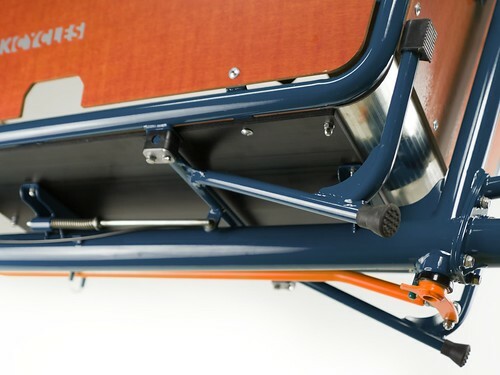 So my advice is: Keep Kr8 as the name for the two-wheeler (already well established), and for the three-wheeler, use what I suppose is the last wordplay possible with _r8: which is Tr8, meaning attribute in english and tries or seeks in dutch. In addition, the Tr-sound has connotations with the digit three, as in the trio, troika, triad. Thanks Aslak, Those are good! I know that the Dutch are tall people, but many of your export markets don’t share the stature! Yours is the only bakfiet I’ve seen that specifically mentions rider height suitability. Do you think the kr8 would be comfortable for a 155cm rider? If the 155cm rider in question has normal to long legs for (her?) height she should be OK on the Kr8 without modifications. If needed the seat post can be replaced with one that allows the saddle to be lowered another 2cm and a narrower (sportier) saddle helps too. So, yes, it will probably work just fine. after a long wait, the E-assisted cargo super bike Kr8 has arrived in Zurich! Our 15-months old daughter loves to ride it so much that she even accepts the helmet without any further issues. Quite the contrary she does not want to have it taken off anymore! Taking her to daycare has now 2 hurdles – the first to get her out of the box and the second to say good-bye. Even though we had to wait a bit longer for the bike to arrive – the whole set-up, packaging, and shipment was very professional and we can really recommend the work cycle to anyone interested in a heavy duty bike! Finally my kr8 arrived, yay! Packaging and shipping was great, so is the bike. But reassembling took a while: unfortunately, some screws for the box were mixed and I had to change them until everything was in place. I amwondering when will the kr8 trike be available and do you have any images/information on it please? The Kr8R three wheeler is still in development and we do not have a date when it’s expected to be available… certainly not before Summer 2016 in any case. that’s the e assist one-plenty of hills and strong wind and ran in Dublin! The new box doesn’t look like it seals at the joins, do you recieve any complaints with wind and water entering through the corners on the box? Chris, I think one customer in Minnesota, USA or another very cold place mentioned that he lined the box with a blanket or sleeping bag in the winter months. Otherwise no, it doesn’t appear to be an issue. Actually in most cases it’s an advantage since water drains easily and dirt falls out too. Is that correct? Also, what is its torque, and what is the battery chemistry (lithion ion?) and aH rating? A few more questions: I assume it comes (or can come) with the Nuvinci internal hub? What are the dimension of the cargo box? What is the total length of the bike & the wheels? Unfortunately our apartment building has a very tight turn at the exit door, so I need to be able to get the bike around that corner! Finally, what is the weight with and without eAssist? Sorry for so many questions! Thank you in advance for your reply! No, we do not fit the Bafang motors to any bikes. The motor system used in the Fr8 V8 and Kr8 V8 is a Schachner from Austria. It is 250W and 36V. There is also a 350W version available but we do not yet have any experience with it. The battery is a Lithium Ion 12Ah. 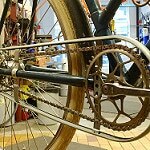 Yes, the rear hub is a NuVinci. 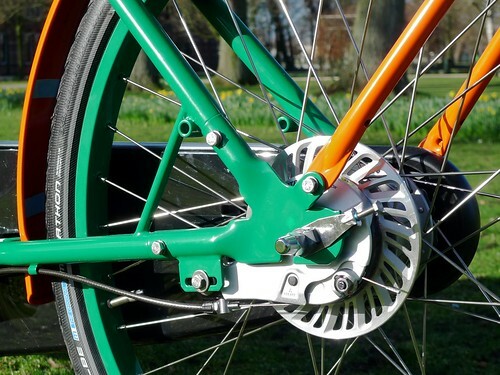 It can be ordered with either Magura hydraulic rim brakes or Shimano roller brakes. The box is angled in every direction so not easy to describe in a blog comment. It’s big enough for pretty much every family application and most cargo applications as well. Total length is 260cm. I don’t know what it weighs. I guess roughly 40kg without accessories and maybe 5kg more with the electric assist system. 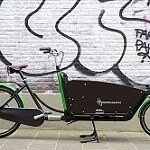 One factor to consider: If you’re in the US or anywhere a truck can’t drive to from the Netherlands you’ll have to purchase the bike from a dealer. New air freight regulations effectively ban Lithium batteries from air cargo. A propos weight – I have weighed mine on my bathroom scales (holding it up and then subtracting my weight), and it’s approximately 45kg with the small rear carrier, so probably 43kg without accessories.